Steam’s Early Access is a dimly lit labyrinth where some games emerge victorious, and some perish to never be seen again. When a game announces that they have bested the proverbial Minotaur, expectations are naturally pretty high. When you think about the implications of a game spending years in Early Access, being play tested by hundreds of thousands of what are essentially beta testers, the game in its finished state should be a refined experience. The keyword being should. 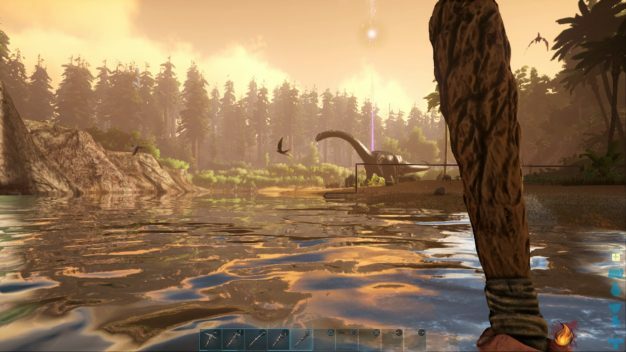 Studio Wildcard has officially released their grand, dinosaur-based survival game ARK: Survival Evolved on consoles after roughly 3 years in Early Access, but as a new player you would never guess it was a finished product. 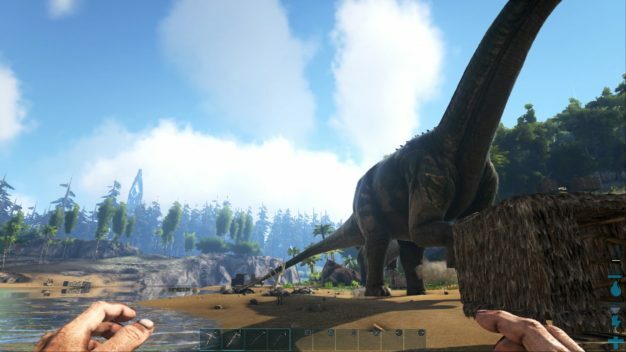 ARK is a primarily multiplayer-focused game that emphasizes battling and taming dinosaurs; this is the main gameplay element separating it from contemporaries such as Rust or DayZ. PvE servers allow you to team up with other tribes of players to engage the dinos and build a community, while PvP adds in the element of tribal warfare to keep you on your toes. You technically could play ARK on your own offline or in a PvE server, but unless you are prepared for an ungodly amount of grind time that would not be advised. I spent 30+ hours playing solo in PvE and it was a long tale of boredom, with flashes of greatness flaring up like oil flames in a burning pan, before ultimately ending in heartache. The most obvious gripes can be made about how under-par the game is on a technical and graphical level. The PS4 version suffers from terrible, choppy frame rate issues, constant screen tearing, pop-in textures everywhere, cluttered and unreliable servers, downright ugly character models, idiotic enemy AI, enemy attacks clipping through walls that lead to unfair deaths. I lost a lot of items and progress due to dinosaurs clipping through the walls of my base and killing me while I was logged out of the game. Despite ARK showing brief glimpses of brilliance, the jankiness of Early Access is still very much present in this supposed release build. When I started up ARK, I had a tough time finding a server that wasn’t packed to capacity or didn’t have a terrible ping that caused massive amounts of lag. I eventually was able to get into one that was just shy of the player cap, but once I started that I found another issue was in the game’s construction restraints. You aren’t allowed to build structures near other players’ structures, which were all over the place. I had to run around blind, dying repeatedly to dinosaur attacks, before finding a clearing to plant my base. I finally built a small safety shack and logged out for the night, but when I tried to log back in my server was at capacity and would not let me in for the entire day. This was beyond infuriating and felt like it stalled out my progress. 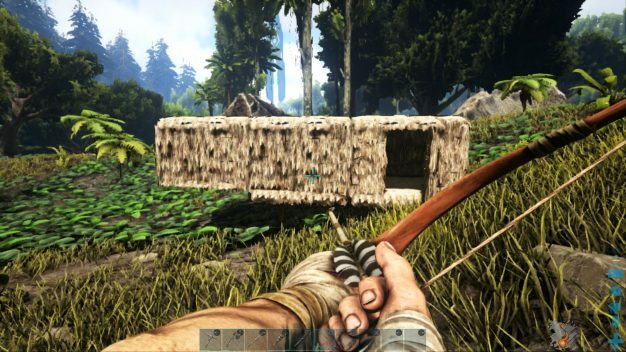 When you do get into a server, one of the very first things that you’ll notice about ARK is that the game doesn’t help you learn the systems at all; it’s all trial and error. In a sense, I can appreciate this hands-off approach when it comes to simple things such as resource collection or crafting, even taming dinosaurs was pretty easy to work out. However in a finished game with as many complex systems as ARK I would greatly appreciate just having the option to at least learn how the game works without having to resort to going through forums online. For example, the tribe system is not explained at all in game. You just see that people are in tribes and can invite you to join in as well; seems simple enough on the surface. However what is not explained is that tribes have a community XP share as well as a complete communist set-up, where in as soon as you join a tribe all of your structures are forfeit to the tribe. Remember earlier when I said my 30+ hours ended in heart ache? This is because I had spent days building up a base on my own, capturing dinosaurs and crafting a castle I could call home. I decided to try joining a tribe when I learned about the XP share, but I lost everything. My days of work, my home, were all forfeit to a tribe of people I didn’t know. It’s the first time in the modern age of auto saves that I lost virtually all of my progress in a game and it crushed me so hard I couldn’t go on. However, all of these negatives aren’t to say that ARK, is a complete failure. The main draw of the game is clearly the dinosaurs and the element of exploration; which is something that the game does fairly well. Your character levels and progresses at a steady rate from caveman tools to advanced weaponry, letting you branch out further and further into the world. The worlds feel gigantic and are genuinely fun to explore. The dinos bring a constant looming threat to the exploration with the chance of a raptor or T-Rex on your tail if you aren’t careful in your journey. If you’re a real dinosaur aficionado this single element is certainly more than strong enough to sell you on the game despite the faults. Even still, it’s understandable that a lot of players, especially completely new players, will have trouble looking past those issues.